Wondering how to make homemade vegetarian meatballs? One simple way to make quick and easy vegetarian meatballs is to use a store-bought ground beef substitute, such as GimmeLean brand. At most grocery stores, vegetarian ground beef substitute such as GimmeLean is usually sold in a tube in the refrigerated section near bagged salads and other produce. At natural foods stores, it's more likely to be near the other vegetarian and vegan meat substitutes and vegetarian deli meats in their own section, though also refrigerated. Make these vegetarian "meatballs" vegan by using an egg substitute instead of an egg, if you're eating dairy-free and egg-free. Not sure what to do with your homemade vegan meatballs? Well, there's always a classic meal of spaghetti and meatballs. Just add these vegetarian meatballs to some store-bought marinara sauce on top of a plate of spaghetti and you've got yourself a quick yet romantic complete Lady and the Tramp-style dinner. Or, make them mini-sized (you'll need to reduce the baking time a bit accordingly if you do) and serve them up as an appetizer with toothpicks for a cocktail party alongside a dipping sauce, such as a sweet chili sauce or some kind of gourmet preserves, such as mint jelly or jalapeno jelly. Pre-heat the oven to 400 F. Lightly grease a baking sheet, baking pan or cookie sheet. Separate the vegetarian beef substitute into several chunks, and place in a large bowl. Next, using a large fork, or your (clean) hands if needed, mash the beef substitute together with the seasoned bread crumbs, soy milk, onion, salt, garlic powder, vegetarian Worcestershire sauce, and the egg or prepared egg replacer until fully combined. Next, shape the mixture into individual balls about 1 1/2 inches round. Bake your vegetarian meatballs in the pre-heated oven until lightly golden brown - about 20 to 25 minutes. Be sure to read the ingredients list on the label if you're purchasing Worcestershire sauce for the first time. Some brands are both vegetarian and vegan, while many brands contain fish (anchovies). 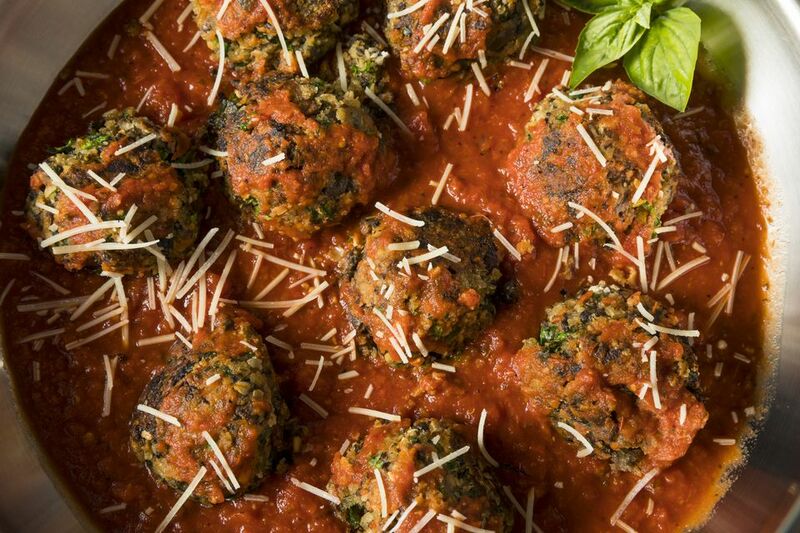 This vegetarian meatball recipe with Gimmelean courtesy is of Lightlife Foods.